When organizing cabinets, you'll find that you'll save yourself a great deal of time (and even money) if everything is easily accessible. You don't have to spend hours searching for that box of cornstarch you know you had somewhere and you won't have to go out to buy a new box. A good idea is to group like items together in small bins and label the contents or even select bins that you can see through for quick identification. 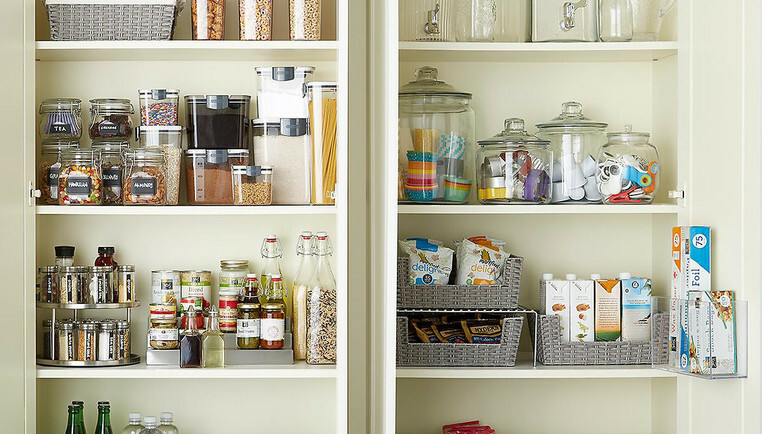 Look for products that are specifically designed to tackle the hard-to-organize items in your kitchen or pantry. Choose racks to keep the lids to your pots and pans (and even plastic food storage containers) under control. Your lids will be easily accessible and won't spill out each time you open the cabinet. Canned goods can pose problems in your cabinets. Because of the depth of the shelves, stacking the cans one in front of the other is just not practical! You will forget what you've got stored in the back because you can't see it. Choose a tiered shelf organizer that provides you with a full view of your canned goods. If you have a door in your pantry or kitchen area, don't neglect that often wasted space. Our Elfa Door & Wall Rack is designed to fit onto the back of a door. The system's flexible baskets provide you with extra storage space for canned goods and other dry foods, cleaning supplies and even bottles of soda! The rack will ease the overcrowding in your cabinets and make it possible to have everything at your fingertips. *Shop our Kitchen Starter Kits for one-click convenience!